Social Security (SS) and Medicare have unfunded liabilities of approximately $40 trillion dollars. In other words, if we are to make good on Social Security and Medicare promises while keeping tax rates at their current levels, we now should have amassed a $40 trillion trust account. Since this did not occur, major tax rate increases and/or cuts in benefits are coming. How did we get ourselves into this disastrous financial bind? The secret is in the political invention of “pay-as-you-go,” the ultimate “free lunch.” But with all free lunches, the bill eventually comes due. The story of pay-as-you-go and the arguments made in its behalf reveal a great deal about political motivation and why we get bad public policies. SS and Medicare provide retirees with a substantial nest egg. A typical middle-income couple retiring at age 65 in 2011, for example, can expect over $900,000 in benefits from SS and Medicare during the course of their remaining years. Absent SS and Medicare, individuals would have had to save privately for their retirement and then, after retiring, to use their personal savings to pay expenses and high medical insurance costs. SS and Medicare allow the couple to save less, retire earlier, or just have much more financial security after retiring. Exactly how much less we saved as a result of these entitlement programs is subject to dispute, but the total amount is likely to be in the tens of trillions of dollars. Unfortunately, the taxes that workers paid into SS and Medicare were not saved. And here is where pay-as-you-go comes in. Instead of saving the taxes by investing in financial assets in behalf of workers, the government handed out the funds to millions of retirees who paid very little or next to nothing into the retirement plans. These individuals were the beneficiaries of trillions of dollars in undeserved and unwarranted government payouts that left the trust funds depleted. One famous case is that of Ida Fuller who retired in 1940 at age 65. Ida paid into Social Security only a total of twenty-two dollars, but her first monthly check from Social Security was for $22.54! Ida lived to be 100 and received tens of thousands of dollars in Social Security payments. This extraordinary payout to retirees made social Security extremely popular and widely hailed as a great success. But the true costs of the system are hidden: the government’s failure to save and invest social security taxes has de-capitalized the nation by trillions of dollars. Private-sector savings support investment in physical capital and create higher paying jobs. But pay-as-you-go exchanges government promises for private saving–promises of payments that come not from accumulated wealth but from taxes imposed on future workers. No savings means no capital accumulation and lower wages. Worse yet, the higher future taxes adversely affect work incentives and production. The road to pay-as-you-go, like the road to hell, was paved with seemingly good intentions. Take Senator Arthur Vandenberg (R-MI) and his impassioned plea for pay-as you-go published in the Congressional Record on January 16, 1939. “A full reserve [for Social Security] is unnecessary…It is a colossal imposition…a monster…” Vandenberg reasoned that adopting pay-as-you-go would allow immediate payouts to persons nearing retirement (like Ida Fuller) and allow a delay in raising the necessary tax rate to make the program sustainable. Republicans particularly liked the delay in taxes, Democrats the immediate gifts to retirees. (Does any of this sound familiar?) Of course, delaying taxes and providing freebie benefits to oh-so grateful current voters was a vote-maximizing strategy for incumbents, but nothing short of inter-generational robbery. Immediacs (see my earlier blog on Immediosis) in Washington won the day and pay-as-you-go became the law of the land. Immediate extraordinary benefits were paid out to persons who contributed very little to the fund and tax rates were temporarily held down. 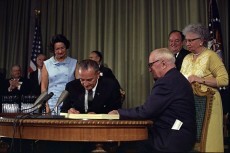 Politicians kicked the can down the road and a quarter century later in 1965, the popular pay-as-you-go Social Security program made pay-as-you-go a foregone conclusion for financing the new Medicare program. Bess and Harry Truman, who paid nothing into the system, received the first two Medicare cards. The bill for all the free lunches is now being delivered.